Students in the Lake and Peninsula School District have less time to complete the same number of requirements this year. To meet the challenge, they are working on projects that fulfill a variety of school standards. One Port Heiden seventh grader will get credit for writing, science, art and culture for making a cribbage board out of a caribou antler. Tyler Croom polishes the caribou antler he is turning into a cribbage board. 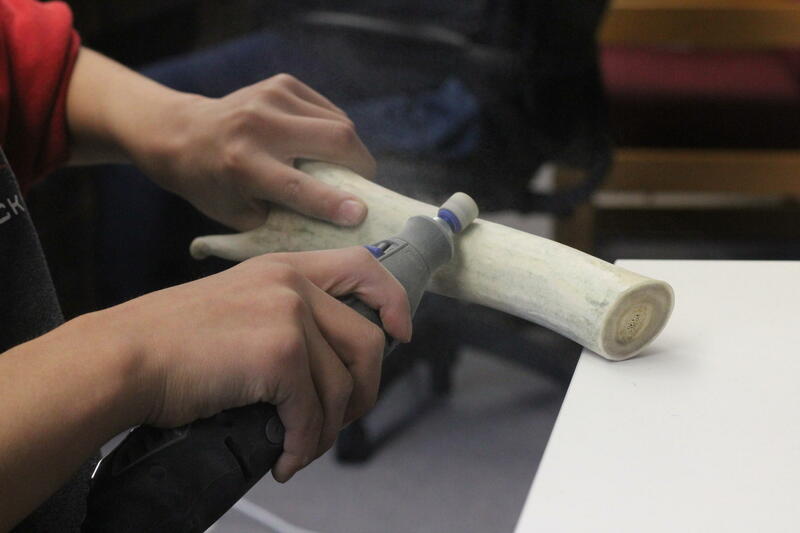 There was a sharp, burnt smell in the air as seventh grader, Tyler Croom, guided an electric polishing tool along the surface of a caribou antler with steady hands. A whirring, buzz filled his classroom at Meshik School in Port Heiden. The areas he had already polished gleamed bright and white. The Lake and Peninsula School District is piloting a new calendar this year. They have dubbed it the “subsistence calendar.” By starting later and ending earlier, the new calendar cuts 77.5 hours of instruction and saves more than $400,000. The tricky part is students still have the same requirements they need to fulfill in a year, but they have less time to finish the standards. That’s where project’s like Croom’s come become crucial. By making a cribbage board and writing a report, Croom will fulfill a variety of school requirements. 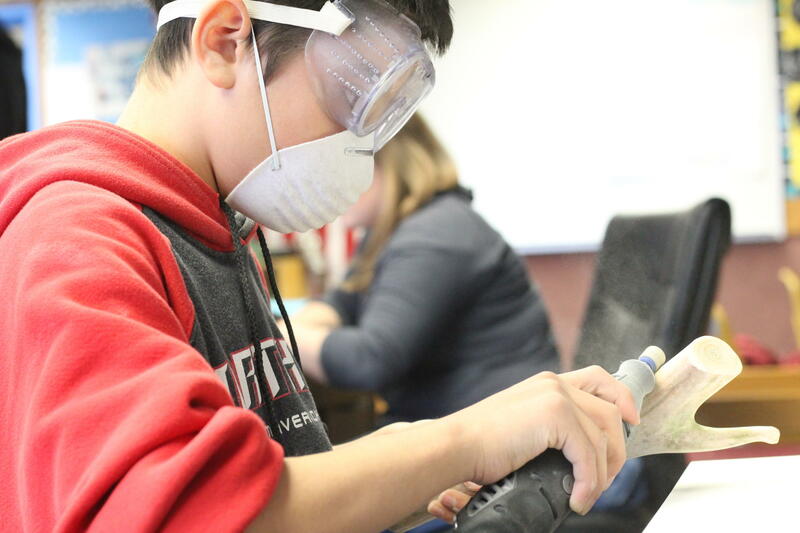 In addition to completing projects during the school year that fulfill a variety of requirements concurrently, students can also document summer activities, like commercial fishing, to count toward school standards. While fulfilling school standards efficiently and effectively may be challenge, Kasie Luke, principal of Meshik School and Chignik Bay School, said that it is one of the new calendar’s most positive aspects. “I think the main strengths really show in our students having spent more time with their families and doing what they do in their summer. It gives them the opportunity to experience more place-based education opportunities and to really take advantage of their experiences in the summer to count as some of our standards toward their graduation requirements,” said Luke. For the 12 schools in the Lake and Peninsula School District, classes started this year on Sept. 5. School lets out on May 1.